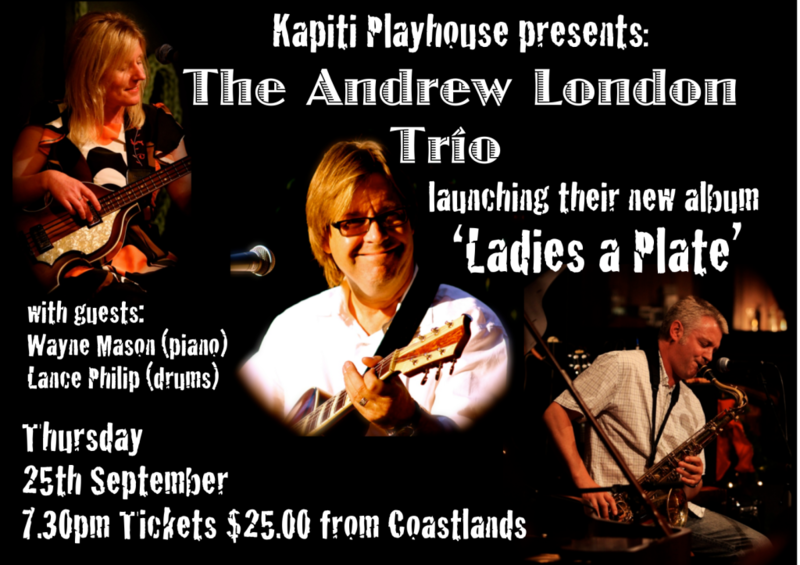 The Andrew London Trio - Ladies a Plate Official Album Launch Concert - Kapiti Playhouse Inc.
Kapiti Playhouse is extremely pleased to be hosting the official launch of The Andrew London Trio’s brand new album, Ladies a Plate. The album will be officially launched with a concert at Kapiti Playhouse Theatre on September 25th at 7.30pm. As well as The Andrew London Trio, special guests Wayne Mason and Lance Philip will also take to the stage. Tickets are just $25 available at the Coastlands Information Desk. Anyone over about 50 who grew up in New Zealand will recognise the ubiquitous phrase ‘Ladies a Plate’, which could be found on invitations to dances or functions in town halls throughout the land right up until about the 1980s. Ladies were expected to bring some baking or finger food, the men would bring flagons of beer in the boots of cars, around which the blokes would gather in the car park while the ladies organised ‘supper’. There’d be a small band required to play music for dancing; foxtrots, waltzes, quicksteps, and of course the Gay Gordon. Communities would get together, gossip would be exchanged, and many a marriage would trace it’s origin to these occasions. Our music, being steeped in the 1940s swing tradition, has always evoked this era, so it was only fitting that I should eventually write a song like the title track to celebrate it. Admittedly I was prompted by a collaboration with pianist Gilbert Haisman, with whom I shared the stage a year or two ago in a show also called ‘Ladies a Plate’. There are a couple of tracks on the album that come from this era; ‘No Moon at All’ and ‘Exactly Like You’, both sung in delightful breathy style by our bass player Kirsten London, perhaps channeling Blosson Dearie. We’ve also arranged Paul McCartney’s ‘You Won’t See Me’ to fit the genre, trying to imagine how Michael Buble might do it. pack furniture, and male insecurities, but have begun to get a little more political with ‘I Think I’ll Buy a Yacht’, ‘Country’s Buggered’ and ‘Heaven For The Climate’ which take gentle potshots at rampant capitalism, rural rednecks and religion. Recorded, engineered and mastered at Matrix Digital Studios in Wellington 2014.